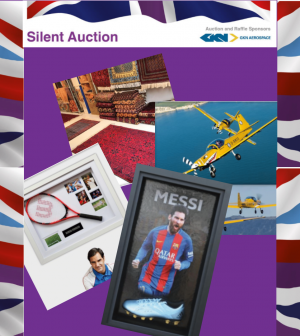 Home > Uncategorised > The 2019 Soldiering On Awards Silent Auction is OPEN! If you’re joining us for Friday’s fantastic Gala Awards Ceremony, you’ll have the opportunity to bid on a range of incredible lots in our silent auction. But don’t despair if you won’t be with us – you can view the lots and place your bids directly on the auction website by clicking here. The auction is now open and will close at 11pm on Friday 5th April. You don’t need to be in the room to place a bid, the auction is open to everyone! Our heartfelt thanks to the individuals and organisations that have donated lots for this auction, including Taittinger, John Novelli, Airbus, Roger & Suzanne Farrell-Cook, James Wilthew, MOD, Schmooly and X-Forces Enterprise. The 2019 Soldiering On Awards Auction is generously sponsored by GKN Aerospace. Proceeds will benefit the recipients of the XFE 3/6/12 programme of support, which is available to all Soldiering On Award Winners.